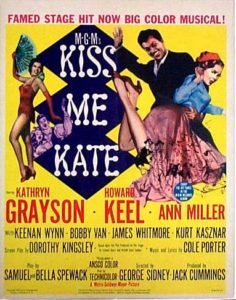 Episode 17: Kiss Me Kate - A Reel Education: The Musical! How does Tommy Rall not get higher billing than Bobby Van??! 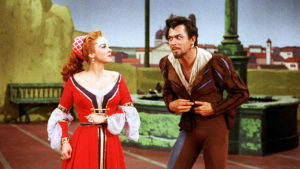 KISS ME KATE boasts so many amazing things (Howard Keel in striped tights! Tommy Rall defying gravity! James Whitmore as the most adorable thug ever!) that you might forget that this is also the movie that put Bob Fosse on the map. 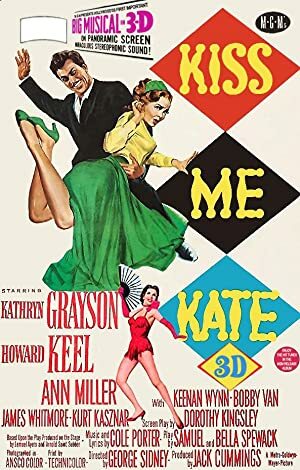 The movie version of Cole Porter’s masterpiece, boasting some of his most clever and saucy lyrics telling the story of Shakespeare’s biting The Taming of the Shrew, Mike and Vinnie have dubbed KISS ME KATE equally as horny as ON THE TOWN (our previous high-water-mark for libido). Making the most of the backstage-musical show-within-a-show format, Kathryn Grayson divas it up bigtime as Lilli Vanessi, typecast as the titular shrew. But Howard Keel is not to be denied his own ham sandwich as his producer/director/star Fred Graham stuffs his ego into those magnificent tights. Rounding out the main quartet are two of this era’s best dancers: Ann Miller and Tommy Rall. Tommy’s first dance break in the movie literally made Mike and Vinnie sit up and take notice. And – just incidentally – this is the movie that launched Bob Fosse’s choreographic career. NBD. Why walk when you can slither? Take a listen and find out for yourself just how “Wonderbar” it is! Plot: An ex-husband and wife team star in a musical version of 'The Taming of the Shrew'; off-stage, the production is troublesome with ex-lovers' quarrels and a gangster looking for some money owed to them.